Hugo Chávez death: Congressmen react in three different ways. Supporters of Venezuela’s President Hugo Chavez react to the announcement of his death in Caracas, March 5, 2013. For over a decade Chavez had used corruption, intimidation, manipulation, and brutal tactics to rule over the Venezuelan people. 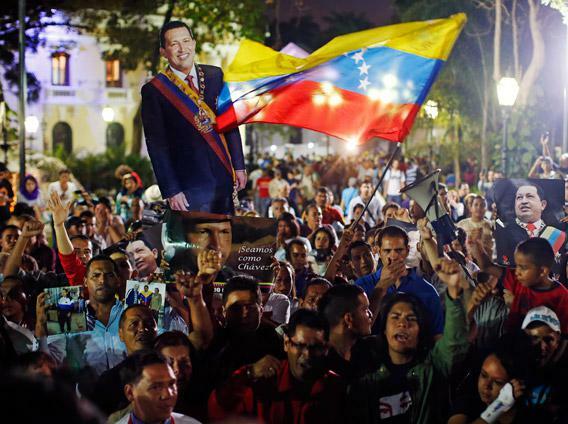 Chavez misruled Venezuela with an iron grip on the government, economy, and the courts as he routinely bullied the media and the opposition to deny the people of Venezuela their basic freedoms. Today his death marks the end of this tyrannical rule but the road to democracy for the Venezuelan people is still very much uncertain. Sic semper tyrannis. After the welcome news of Hugo Chavez’s death, I hope that the oppressed people of Venezuela will be able to live in freedom, not under miserable tyranny. I look forward to working in the House to promote a free, democratic, and pro-American government in Venezuela. My thoughts and prayers are with President Chavez’s family. In this time of transition, it is my hope that the United States and Venezuela can build a productive relationship for the future. Kennedy’s father, a former congressman, runs Citizens Energy. For eight years, Citizens Energy has expanded its reach thanks to sweet deals on oil from Venezuela. You see the conflict. Correction, March 6, 2013: This post originally misspelled Rep. Ileana Ros-Lehtinen’s first name.